A Viking, a Neanderthal and a pirate are all on an island… there’s got to be a joke in there somewhere right? Probably, and you’ll have plenty of time to find it as the latest party game to arrive on Xbox One brings them all together, along with many other wacky characters, as you go head to head to nail down your spot on the podium, thanks to a series of party style mini-games for all the family to enjoy. The game in question is Marooners and it’s fair to say it’s a bit good. Unfortunately though, it all starts to grow a little tiresome when the repetitive cycle starts to build on proceedings, and then it’s a test of endurance if you hope to get any further enjoyment out of things. Before we set too much of a negative tone on the overall experience though and give off the wrong impression, Marooners isn’t a bad experience at all. In fact, if you like your games in short bursts of 45 minutes at a time, then Marooners is likely to be something you’ll find great enjoyment in. However, if you’re after something you can dip into regularly or for longer periods, you’ll probably find little long-lasting enjoyment here. 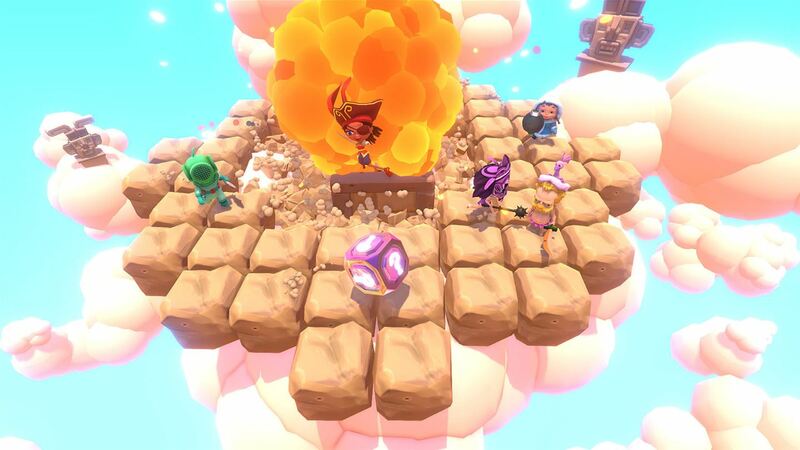 So, the premise of Marooners is pretty simple, there are two main game modes; Party and Arena – both of which can be played in an online or offline capacity, across either Linear or Chaos modes. In Party mode, there are a range of different mini-games to play, each of which require a lot of focus and a little luck if you hope to last more than a few seconds – quite literally – as there is a lot that goes on. 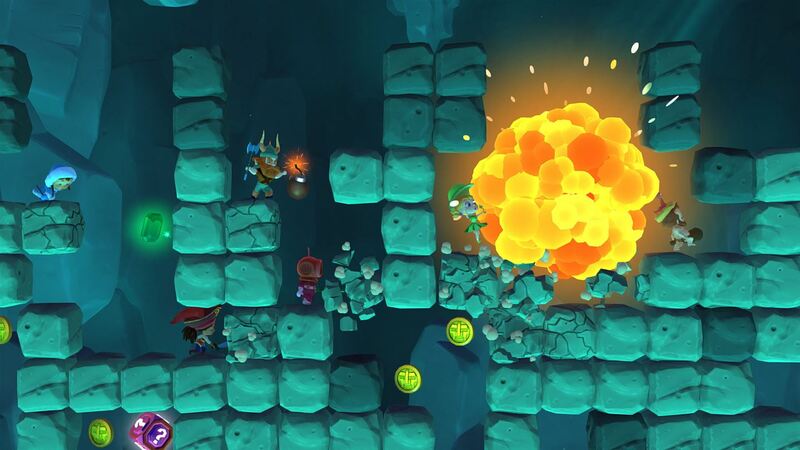 The games available certainly allow for some great variety; one will see you digging your way down a cave as fast as you can to reach the treasure at the bottom, all whilst trying to trap your opponents along the way, with another tasking players to outrun ensuing boulders similar to Indiana Jones, whilst another still will see you darting across a melting ice cap in an attempt to be the last man standing. 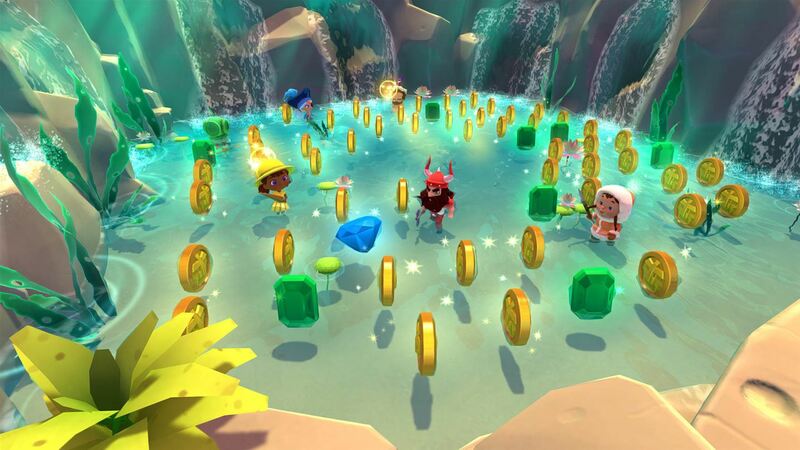 Each of the Party mode games is really about being the sole survivor at the end, grabbing as many gold coins as possible in the process, along with a treasure chest if you’re lucky enough to be in the right place at the right time when it appears. Arena mode is very similar, as in it has multiple game types to play through, but instead of maps that scroll – like those in Party mode – here players standoff in arena situations purely looking to lay the smackdown on their opponents, earning points whilst utilising things like power-ups that bring bombs, boxing gloves and more to help you get the job done. As for the Switch modes – Linear and Chaos – it won’t take long before you realise just how important these are. On my first game I had accidentally left Chaos mode enabled, and it caused a hell of a lot of confusion as choosing this Switch mode means each game type will only remain active for a very brief period before switching to the next mode, and back around again until all the different game types are finished. It’s a great way to spice things up, but it can be awkward as it becomes near impossible to get into the flow of things as the switch is all too frequent. Linear mode meanwhile allows each game type to be played out to the end before switching and is by far the preferred way to play. The goal of each of these games is simple – players aim to earn as many gold coins as possible, and this is done by simply surviving or putting pain to your opponent, all dependant on the mode you choose. None of the games are overly long mind, with most lasting roughly a minute or so and even though it would be nice to have a little longer in each match, there is no shortage of action as things turn hectic within mere seconds of a match starting up. Unfortunately, with each proving so short in length, it doesn’t take long to filter through each of the available game types, meaning it’s not long before you become overly familiar with each one. Of course, this isn’t necessarily a negative thing, and many might argue that it will make for more competitive play as everyone learns the ins-and-outs of how each game works, but in all honesty when the same match types roll around over and over again, and a full game only takes ten minutes to run through, things quickly start to feel repetitive. To win a game, players will need to have earnt the most points by the time the podium screen rolls around, and this is usually found after five or six games. After the final positions are decided, all the points/coins earnt go directly onto your XP bar, with players able to level up after earning enough. Levelling up isn’t important for much more than bragging rights, however it does allow the unlocking of new characters to add a little more spice into the character selection – not that there aren’t enough to start off with. Because in actual fact, there are quite a few characters available within the game, although the only difference between each is purely cosmetic. 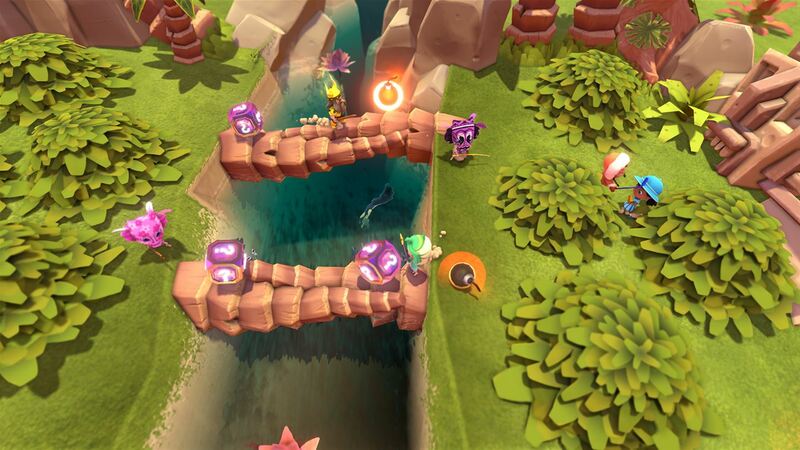 As mentioned before, Marooners can be played in both an online and offline setting. If you decide to take the fight online, the matchmaking system is great and allows players to drop-in and drop-out with ease. Unfortunately, you will struggle to find a full line-up for your games, however this isn’t too much of an issue thanks to the presence of A.I. bots for both online and offline play, meaning having a full 6-player battle is a possibility every time. Other than that, there’s very little else to find within the world of Marooners. If you’re after a casual experience that can be enjoyed either online with strangers or offline with family and friends, then this is a great little game for you to earn those bragging rights. If you like a little more adventure to things though, then you’re probably best suited looking elsewhere. But do I think you should be bothering with Marooners? Sure… just make sure you have a few other games lying around after the repetition begins to set in. Next articleThe Station will test your puzzling brain and it’s out now on Xbox One, PS4 and PC!